Paris, February 27th 2014 – In order to reinforce its voting policy and establish its engagement with companies, Fédéris Gestion d’Actifs, a pillar of French insurance product and diversified management, and pioneer of responsible investment management in France, has retained Mirova, a subsidiary of Natixis Asset Management dedicated to responsible investment, as its engagement advisor. As Fédéris Gestion d’Actifs moves forward with implementation of its voting policy, the asset management arm of Malakoff Médéric Group will be supported by the advice and technical tools of the Mirova team dedicated to social, environmental and governance analysis, as well as engagement and voting. Fédéris Gestion d’Actifs and Mirova share a conviction that dialogue with companies is an essential lever for asset managers and institutional investors seeking to promote improved Corporate Social Responsibility (CSR) practices, which in turn increase the sustainability of the economy and thus the return on long-term savings. Mirova’s in-house engagement platform will be used to assist Fédéris Gestion d’Actifs in the process of engaging target companies in dialogue about environmental social and governance (ESG) issues. This platform was specifically designed to bring together institutional investors with a shared vision of responsible investment. The tool it offers will enable collaborative, responsive engagement actions on ESG issues that respect the specificity, identity, and values of each member. Fédéris Gestion d’Actifs is an asset management firm rooted in the social economy sector that had EUR 27 billion of assets under management as of 30 June 2013. The Fédéris Gestion d’Actifs team, which consists of 48 individuals is the fully owned subsidiary of the mutual social welfare group Malakoff Médéric. Fédéris Gestion d’Actifs has developed a management style tailored to its clientele of insurance companies, employees benefits providers and mutual health insurers. Financial portfolio strategy is anchored in the search for companies with solid performances that meet strict risk criteria. Mirova, the Responsible Investment subsidiary of Natixis Asset Management, develops an engaged approach aiming to combine value creation and sustainable development. 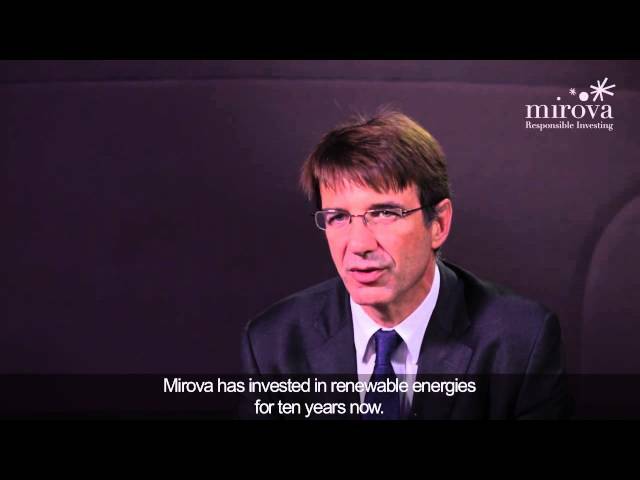 Mirova’s philosophy is based on the conviction that integrating sustainable development themes can generate solutions that create value for investors over the long term, not only thanks to a better appreciation of risks, but also by identifying favourable investment opportunities in a changing world. Mirova offers a global responsible investing approach: equities, bonds, infrastructure, Impact investing,(1) voting and engagement. The second-largest European manager of open-ended SRI funds(2) and N°1 in Impact investing in France(3) and in Europe(2), Mirova has €3.4bn in AuM and €38.3bn in voting and engagement. Mirova brings together 40 multi-disciplinary experts, specialists in thematic investment management, engineers, financial and ESG(4) analysts, specialists and experts in socially conscious finance and project financing. Mirova’s fund range is distributed by Natixis Global Asset Management’s global distribution platform and is designed for all types of investors, both professional and non-professional. Source: Natixis Asset Management – December 30, 2013. (1) Impact investing: investments with a strong social and environmental impact. (2) Source: Feri Lipper - 04/2013 – excluding the money market funds. (3) Baromètre Finansol 2012. Impact Investing: of which €55 million invested directly in solidarity organisations. (4) ESG: Environmental, Social/Societal and Governance. References to classifications, awards and/or ratings are not an indicator of future performances by the funds and/or fund manager. Source: Natixis Asset Management – December 30, 2013. (1) Seeyond is a brand of Natixis Asset Management. (2) Mirova is a wholly-owned subsidiary of Natixis Asset Management. Natixis Global Asset Management, a wholly-owned subsidiary of Natixis, comprises management and distribution firms based in Europe, the United States and Asia. Assets under management totaled more than €629.2 billion worldwide.